Electronic cigarettes are a hot topic right now. Some people love them and others… not so much. Why do some people use e-cigs? Using e-cigs or “vaping” is a way for people to maintain the habit or routine of smoking (think: going outside, lifting something to your lips, inhaling, etc). For some people, smoking cigarettes is incredibly difficult to quit and they may find that vaping provides a way to “smoke” without actually using combustible tobacco products. What are the risks of using e-cigs? Are they actually better than smoking cigarettes? In short, no one knows. 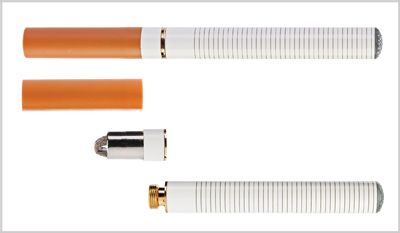 E-cigs are relatively new technology and have been in the U.S. since 2007. This means long term studies are not possible yet, and the devices and liquids used inside of them are not yet regulated by the FDA. There are hundreds of e-cig manufacturers and no consistent standards. This means that we don’t how much nicotine they contain (for example, one study found nicotine in products labeled “nicotine free”). Other harmful chemicals might be inhaled as well. Without regulation, users cannot accurately weigh potential benefits and risks. There is also concern that young people use e-cigarettes for recreational purposes rather than for smoking cessation. Vaping is heavily marketed to adolescents as a cooler, safer way to use tobacco. One study has shown that adolescents who used e-cigarettes were more likely to try combustible tobacco products within the next year (JAMA. 2015;314(7):700-707). Beginning January 1, 2016, e-cigs will be banned in some public areas of Durham County. The ban will mostly affect bus stops, public parks, and shopping malls. The concern is that other people are exposed to the vaporized chemicals from e-cigs (secondhand vapor, if you will). However, e-cig supporters think that this will prevent people from quitting smoking. An Asheville MD writes about some of the risks and challenges with vaping. We don’t know much about e-cigs. We do know that there are many other products available that have proven benefits and are safe for smoking cessation. The gum, lozenge, patch, and pills (like Zyban or Chantix) are first line choices until we have more information on e-cigs. All of these products are available at Campus Health Pharmacy. Smoking cessation: If you smoke and are interested in quitting smoking, find help and resources at QuitlineNC. You can also visit Campus Health Services or make an appointment with a CHS provider (919-966-2281) to learn more about smoking cessation. Mariah Justice Sigmon is a fourth-year PharmD student at the UNC Eshelman School of Pharmacy. She attended UNC Chapel Hill for undergraduate coursework. Mariah enjoys reading, cooking, and hiking with her husband and their dog.